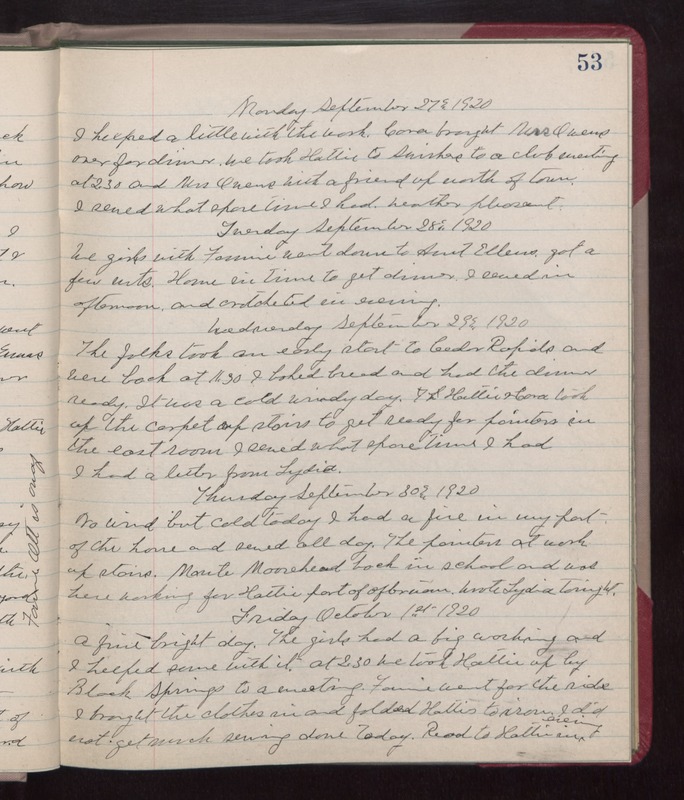 Monday September 27th 1920 I helped a little with the wash. Cora brought Mrs Owens over for dinner. We took Hattie to Swishers to a club meeting at 2.30 and Mrs Owens with a friend up north of town. I sewed what spare time I had. weather pleasant. Tuesday September 28th 1920 We girls with Fannie went down to Aunt Ellens got a few nuts. Home in time to get dinner. I sewed in afternoon and crotcheted in evening. Wednesday September 29th 1920 The folks took an early start to Cedar Rapids and were back at 11.30. I baked bread and had the dinner ready. It was a cold windy day. Hattie & Cora took up the carpet up stairs to get ready for painters in the east room. I sewed what spare time I had. I had a letter from Lydia. Thursday September 30th 1920 No wind but cold today. I had a fire in my part of the house and sewed all day. The painters at work up stairs. Monte Moorehead back in school and was here working for Hattie part of afternoon. wrote Lydia tonight. Friday October 1st 1920 A fine bright day. The girls had a big washing and I helped some with it. At 2.30 we took Hattie up by Black Springs to a meeting. Fannie went for the ride. I brought the clothes in and folded Hatties to iron. I did not get much sewing done today. Read to Hattie in evening.